LONDON, April 8, 2019 /PRNewswire/ -- Through prolonged bear downtrends in the cryptocurrency market, Tokenmania Asset Management Corporation (TAMC) provides cryptocurrency asset holders with solutions across a full spectrum of risks, rolling out financial products listed on the COBINHOOD Exchange that allow participants to grow their cryptocurrency assets up to 22% through the downfall. Since skyrocketing to a peak of over USD $800 billion in January 2018, the total market capitalization of cryptocurrencies has fallen dramatically to only USD $130 billion. Despite high volatility and declining trading volumes in the secondary market of cryptocurrencies, TAMC remains optimistic about the future outlook of cryptocurrency assets. In fact, the company believes more promising projects can better distinguish themselves from frauds in the aftermath of ICO hype. With top-notch quantitative trading teams implementing the arbitrage strategy and the trend-following strategy, TAMC is able to provide an array of wealth management offerings ranging from low-risk options with stable incomes for passive crypto asset holders, such as the Fixed Income Products, to Active Fund Products with higher expected returns for risk-seeking players. "TAMC's financial products are an ideal choice for cryptocurrency beginners and long-term holders who are not comfortable with trading by themselves, as often times they find great difficulty determining proper position size and cutting losses decisively due to lack of trading experiences," said Enzo Lin, Business Director of TAMC. "Having recognized a strong global presence and high security of the COBINHOOD trading platform, we are delighted to list Active Fund Products and Fixed Income Products on COBINHOOD since December 2018 with a minimum purchase amount of 0.01 BTC. This collaboration showcases our dedication to delivering high quality services not only for enterprise clients but for different types of individual participants with friendly, reliable alternatives." Managed by experienced cryptocurrency professionals through comprehensive market research, forecasts and quantitative modeling, the 90-Day BTC Active Fund Product on COBINHOOD hit all-time high gains of 18.58% and settled at 13.11%, helping users seek higher returns in a fairly short period of time. The 30-Day USDT Fixed Income Product and the 30-Day BTC Fixed Income Product also have an annualized yield of 6% and 5.46%, respectively, maintaining a stable income for cryptocurrency asset holders while assuring asset safety. Continuing the strong momentum of previous financial products, TAMC will launch a new 90-Day BTC Active Fund Product on COBINHOOD starting on April 11, aimed to collect as much as 20 BTC with expected returns up to 22% and attract more cryptocurrency asset holders in Europe and Asia to join the program, which account for 54.8% and 44% of the previous Active Fund user base. 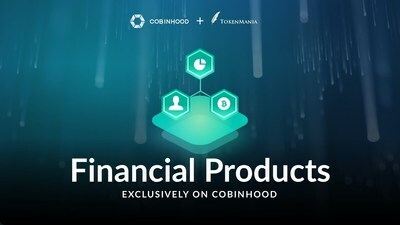 For more information, please visit COBINHOOD's Financial Product website. Tokenmania Asset Management Corporation (TAMC) is the world's leading crypto asset management group with over 40,000 BTC (over USD $200 million) of proprietary capital under management. It was founded by a group of seasoned crypto asset investors and traders. Our trading team contributes more than 3% of the trading volume in global cryptocurrency trading markets. Our quantitative trading strategies enable us to preserve and grow crypto assets in over 150 cryptocurrencies. We offer one-stop crypto asset management solutions to institutions and accredited investors. Our crypto wealth management product covers over 2 million users. TAMC developed crypto derivatives offerings include cryptocurrency options, swaps, ETF, VIX etc. in collaboration with top Chinese hedge funds. Launched in 2017, COBINHOOD is a next-generation cryptocurrency service platform featuring the world's first zero-trading-fee cryptocurrency exchange. The company was founded by Popo Chen, the co-founder of '17 Media', and Wei-Ning Huang, former Senior Software Engineer at Google Taiwan, with the vision of shaping future economies by creating a financial hub for the blockchain era. COBINHOOD believes the evolution of blockchain technology and a decentralized financial landscape will transform global capital markets and business organizations with long-lasting impacts.